Dozens of Hakol Chai protestors carrying signs saying "Horses and donkeys are not vehicles," "Animals are not cars," "Carriages and carts are a dead trend," "They're hurting; don't you care?" 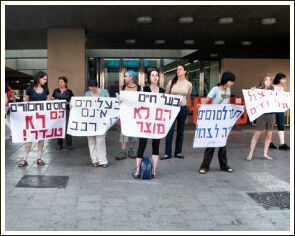 and "Stop Animal Abuse" blocked the entrance to Tel Aviv's City Hall to protest the Mayor's refusal to ban the use of horse-drawn carts in the city. These animals are overworked, made to carry heavy loads beyond their capacity through busy city traffic, not provided with veterinary care, and forced to stand in the hot sun without water or shade. Often beaten and starved, eventually they collapse in the street, and animal groups are asked to move them out of the way. Tel Aviv's municipal veterinarian agreed with Hakol Chai that abuse cannot be prevented through regulations, especially since the city has neither the funds to regularly inspect the horses nor a facility to house them if they remove them from their abusers. Still, the Mayor continues to take no action. The protesters passed out hundreds of pamphlets explaining the plight of the horses to pedestrians on the street that runs in front of City Hall, one of the city's busiest, and also to city employees as they entered and exited the building. 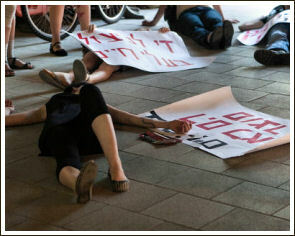 Some of the protesters lay on the ground as if they were dead to depict what becomes of the abused animals. 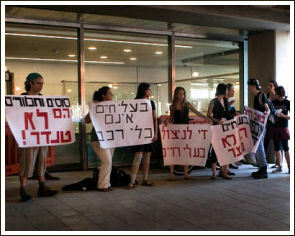 Hakol Chai's protest, part of the Second International Action Against the Horse-Drawn Carriage and Cart Trade, was one in a series of actions to raise awareness of the issue. Hakol Chai has repeatedly exposed the problem of horse abuse in Jaffa, the old part of Tel Aviv, rescued and rehabilitated abused horses, and pressed the City Council to deal with the issue until it convened a special session on the subject. The organization also wrote to Mayors around the country, urging them to take action to protect these animals who are often abused. In response to Hakol Chai's campaign, cart horse owners began heavily lobbying the Mayor's office to prevent the enactment of a ban and so far, the Mayor has been reluctant to take action against this special interest group. 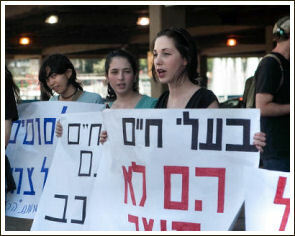 In December, 350 city residents turned out for a protest concert organized by Hakol Chai, at which musicians and singers who supported the cause of the horses volunteered to perform. Hakol Chai will continue to take action to keep the issue in the public eye until a ban is enacted. 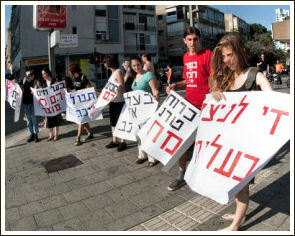 city of Tel Aviv, see Help Stop Horse Abuse in Israel.